This article by Robert Loerzel originally appeared in Pioneer Press on February 18, 2004. Edward Albee, one of the most famous living playwrights, says he never writes second drafts. What about the common theatrical practice of revising a play as it goes through the rehearsal process for the first production? “Most of these changes that happen in rehearsal are not the playwright’s idea,” Albee said, speaking by telephone from his home in New York. Albee said an idea for a play will occur to him, and then he will spend anywhere from a few months to three years mulling over the concept of the play, building the characters, plot, theme and dialogue in his head. But Albee said it’s hard for other people to understand the methods he uses to write a play. “Nobody understands the process except another playwright,” he said. Albee, whose plays were the focus of a festival last fall at Chicago’s Goodman Theatre, has never received unanimous praise from the critics. He says he doesn’t worry too much about negative reviews, because the critics seem to like his plays better as time passes and new productions are mounted. By focusing too much on a play’s supposed chances of commercial success, critics are setting the boundaries on “what the audience should be allowed to see,” Albee said. In his lecture Saturday, Albee will discuss the condition of American theater and the current political climate in the United States. An outspoken liberal, Albee is harshly critical of the Republicans who are in charge in Washington. At an early age Albee reacted against the conservative beliefs of his wealthy adoptive parents. Later, his parents had difficulty accepting the fact that he was gay. Albee was estranged from them for years. Anyone who’s seen Albee plays, including the recent “The Goat, or Who is Sylvia?” may see Albee’s biography as the source material for his dysfunctional domestic dramas. Albee, however, dismissed such attempts to draw parallels between the life of an artist and his creative work. “While we did have childhoods and we do lead lives, … we writers do invent things, and they don’t always come from our past,” he said. And how does a playwright keep Hollywood from messing up his plays? By insisting that they shoot any film adaptation from the original play rather than writing a new screenplay. “I don’t let anyone else write the script,” Albee said. “Virginia Woolf” succeeded because its stars stood by Albee and his play, refusing to let the studio change it, he said. Albee has just finished writing a play called “Home Life,” which brings back the characters he created in one of his earliest works, “Zoo Story.” The events in “Home Life” occur just before those of “Zoo Story.” The Hartford Stage Company plans to perform the two plays together. 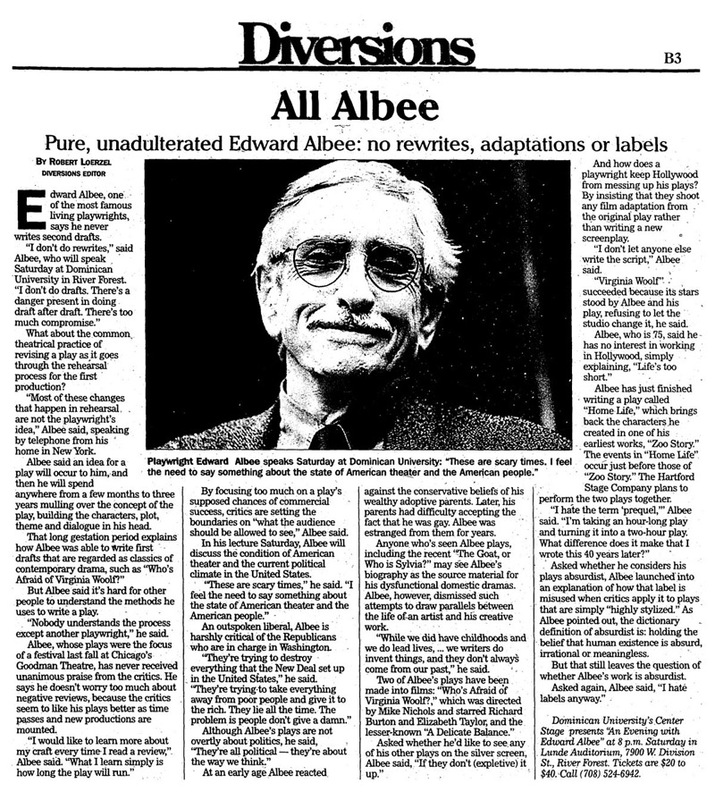 Asked whether he considers his plays absurdist, Albee launched into an explanation of how that label is misused when critics apply it to plays that are simply “highly stylized.” As Albee pointed out, the dictionary definition of absurdist is: holding the belief that human existence is absurd, irrational or meaningless. But that still leaves the question of whether Albee’s work is absurdist.